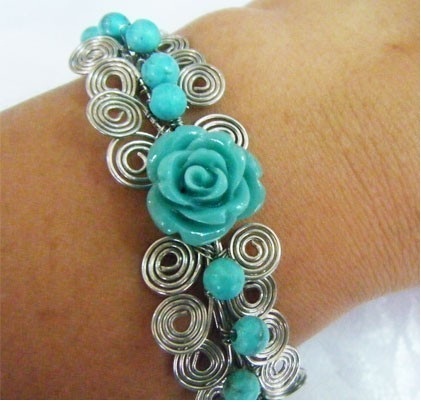 The beautiful spirals and beads formed this beautiful bracelet. This design is adapted from the famous Egyptian coils. The tutorial provides pictorial step by step guides in constructing the bracelet using Egyptian coil technique. All you need is just some copper wires and some beautiful beads or accessories to decorate it. Frankly, this is one of my favorite design and a fun project to work on. This tutorial shows guides on how to make this wired capped Tear Drop Turqouise Earrings. Learn how to make this gorgeous looking beaded pendant using simple materials. The tutorial is preferably for someone with intermediate level. It comes with both graphical bead pattern and pictorial step by step guides, so the beginner might give it a try too. This design uses 2 color tone to turn the beads to a gorgeous beautiful flower pendant. I hope you like the tutorial. Wonder how to wrap a bead into a beaded ‘basket’? The tutorial shows you exactly how to make it. Learn the basic and you can make other variations of shapes. 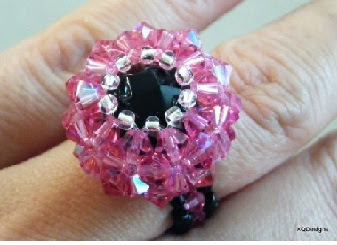 The tutorial comes with both graphical bead pattern and pictorial step by step guides so it is easy to follow even for a beginner. This tutorial is a variation of the Celtic Star Chain Maille technique, a simple yet beautiful technique with so many possibilities. With the Celtic Star Chain Maille you can create motifs and link them together to create a necklace, or bracelet, or you can choose to create the Celtic Star Chain Maille as a solo piece and use it as a pendant or like in this tutorial, a pair of earrings. Just use your imagination and you’ll create wonders with chain maille technique.